NASA astronaut Scott Kelly will conduct the first ever NASA Reddit Ask Me Anything from space to help everyone understand what it means to spend a year in space. A year is a long time to live without fresh air, gravity and human contact from loved ones. While science is at the core of Kelly’s groundbreaking spaceflight, it has also been a test of human endurance. Kelly has just completed an unprecedented 300 consecutive days in space, and he has two more months before the end of his Year In Space mission which began last March. By the end of this mission, Kelly will be the first American to spend one continuous year in space and the record holder for total days in space and single longest mission. To say the least, he is currently NASA’s most experience astronaut. The Reddit AMA will be held on Saturday, Jan. 23 at 4 p.m. ET. To follow the event, visit the Reddit AMA page. Kelly’s session will be added to the page once it begins. Don’t be afraid to ask your questions. Connections back on Earth are very important when isolated from the entire world. So Kelly is looking forward to connecting with you during this event! You can continue to follow Kelly’s Year in Space on his Twitter, Facebook and Instagram. Hello NASA astronaut Scott Kelly First, thank you for your fierceness service. My question is how has your perspective changed on humanity viewing Earth from the ISS? I Love what you do!! Do you see any other orbits or galaxies?? You can see on the right hand side the scheduled person, etc. 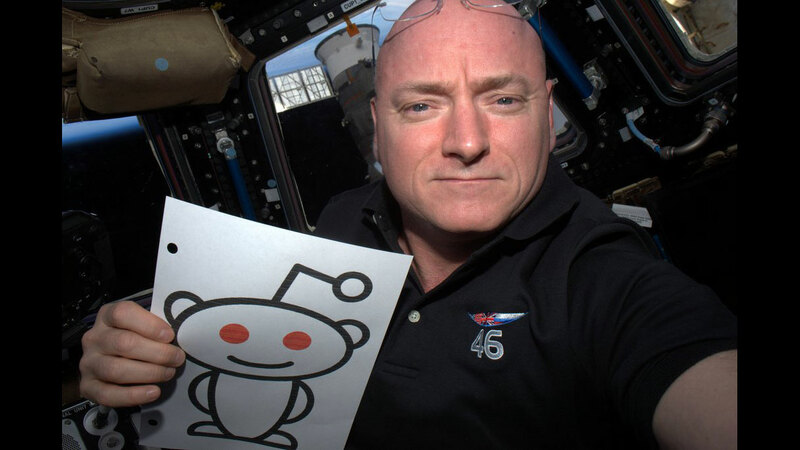 Scott Kelly, what do you miss the most about living on earth? What will be the first thing that you will do when you will return back? Do you think that you could prolong your stay on the ISS for more than 12 months? Can you see anyone beating your record? Can you see the people who are watching you when you pass overhead.? Thank you for all you have shared with us, my grandson is learning so much about our earth! What does it feel like to see earth for the first time from space? Wondering: Once an astronaut returns to Earth (after a long stay in Space) what problems of readjustments does the entire body-mind have? And how long does it take for the body-mind to reset itself? Thank you for the wonderful pictures. They are fantastic I loved the snow thunder. I’m snowed in Montgomery county pa.
~ asking anything ? = why do ya’ll not split that steam coming out your HHO rockets and re-burn it with simple chemthermosis- high presure electrolysis layers in your rocket exhaust ram air oblatable cone liners while in the lower atmosphere scott , or was that to be the secret weapon rolled out once all your rockets went green , when the space race revs up to that point of spectacular spectral ? Have you encountered or any of your colleges experienced anomalous alien encounters that profoundly affected you personally, on board the ISS. If so, how did you feel? Thank you for your contribution to space and Science. My name is Brooke Benton and I am 5 years old. I live in Missouri city T x. My question is ? What do you do in space and are aliens real? Hi I’m Claire and I’m eight and I live in misorri city tx my questions for u are? did u get bored all 300 days? And when your in space can asteroids hit earth? how was it being an astronaut. Hi my name is Camryn I’m 11 years old and I live in Missouri City T.x. I want to grow up and be an astronomer so I wanted to ask you a few questions. How is it being with NASA and how many galaxies are there? Hi my name is Paige and I live in Missouri city tx. I have watched many documentaries on space and was really interested in black wholes. I really wanted to know more about them. I wanted to ask have you even seen one if so we’re you afraid. Are there provisions on the SpaceStation if a medical emergency takes place? If so, what are they? Unable to do an AMA thru Reddit. Emailed them (mods@iamaofficial.com) per website instructions, response is “in meetings all weekend.” Hoping to ask a question! Any suggestions? has Napa mapped the constellations from obit? My little boy looks for the moon every day…future plans for longer than a year? has NASA mapped the constellations from obit? i often wonder if you can hear or have ever heard anything ‘in space’,, anything out of the ordinary??? I saw you. I can’t hide my joy. Thank you so much for the beautiful flying! Please have a safe journey and enjoy! Hello…:). I am sure you are busy up there! I am on the Reddit site waiting to ask you a question. Did you postpone the AMA session? If so, when can I tune in? Good Afternoon, Commander Scott Kelly, First of all I want to salute you. Thanks, for sharing and educating and teaching us about everything related to being an Astronaut. I wait and watch for every tweet you send. You start and end my day. I had know idea I loved Science so much until, I started following you and re-learning everything since being in high school and/or college. Anyways, when you return from your mission. Do you think you will want to revisit your current mission again. Did you enjoy keeling us abreast through Tweets. Or, where you wishing for more advanced technology in the future to communicate. Oh, how was it playing ping pong. I wish you could send some students up there next time with you to play ping pong. I have a 16 year old who keeps current on everything your mission stands for through his school. They salute you as well. Keep up the good work. God Bless You. 300 days in space, a great achievement and a great way of demonstrating dedication to the advancement of science for the good of humans and our planet. What do you see as your biggest achievement that will make the differnece for the current and future generations? If you had a message, what would that be? Thank you for what you are doing! I can’t imagine what it must be like to be there for a YEAR! Do you feel a spiritual presence or that God is there with you? Has any strange things happen while you are so far from us? I think I would have such a feeling of loneliness but I am sure from some of your pictures you get to see some really spectacular sights! Do you find it hard to believe that something so beautiful could just appear out of no where? There has to be some thing so much greater then we to have everything at just the right time and place to create our galaxy! How could it just happen out of no where? Has being up there changed your beliefs? I am so interested and have to many questions. I am sure we all do! May God Bless you and have a smooth trip home.You will be kept in my prayers! I wonder what it will feel like to you when you are back on earth and if this expedition has change you any? How is it up there, on ISS? Did you see any planets? Have you had any particular change of sensibility in yourself during a long stay in microgravity or anything to get you hooked? Anyway, I can’t help but respect you for the long stay in space! I’m Andrew age 14 I’m so interested in space I take my telescope out every night and sometimes I see the international space station go by its an nice view also how is it up in space is it fine is it good when are you coming back down to earth? Commander Scott Kelly and Flight Engineer Mikhail Kornienko, of the One-Year Crew, and Expedition 46 Flight Engineer Sergey Volkov are scheduled to land March 1. Thanks for going out to #SpotTheStation!